Six-time IndyCar Series winner who has won five times since 2015. Was an IndyCar Series championship contender for the first time in his career in the 2015 season until the season-finale where he entered the double-points paying race in Sonoma in second place and the highest-ranked Honda-powered driver. He was in sixth place with nine laps to go but was hit from behind and ultimately finished 18th in the event and a career-best fourth overall in series standings. 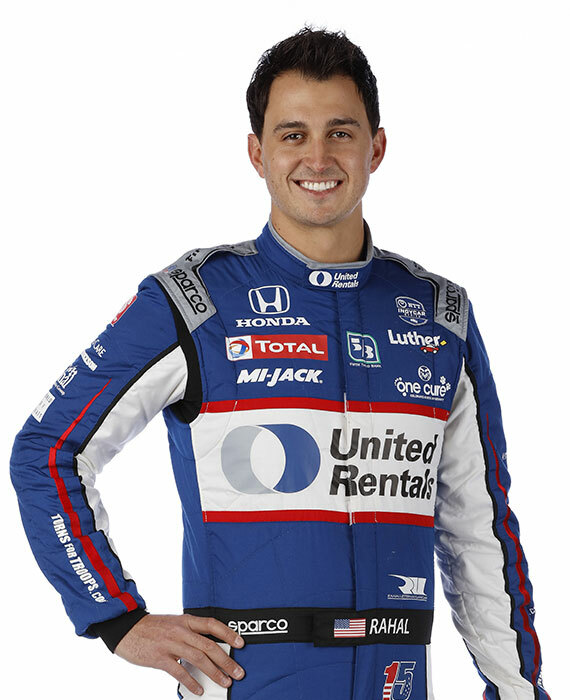 Rahal earned a series-high six podium finishes including wins at Auto Club Speedway (Fontana, Calif.) and Mid-Ohio Sports Car Course in 2015. Became the youngest winner in IndyCar Series history when he drove to victory in his series debut in St. Petersburg at the age of 19 years, 93 days old in 2008. Became the youngest pole winner in series history when he won pole at St. Pete (street) in 2009 at 20 years and 90 days old and again that season in Kansas (oval). Missed becoming the youngest pole winner in series history at ’08 Milwaukee race by 2/10th of a second over a four lap average to Marco Andretti and started a career best second in what was the first Andretti/Rahal front row since 1992 in Loudon, NH. Became the youngest Champ Car driver in series history to finish on the podium with second place in Houston ’07 at 18 years, three months and 18 days old. Led three Champ Car races in his rookie season (’07) and set the Fastest Race Lap in Australia (record still stands). Runner up to 2006 Champ Car Atlantic champion Simon Pagenaud despite winning 42 percent of the races (5), 33 percent of the poles (4) and finishing on the podium 50 percent of the time (6) in a chase that concluded in the season finale. Co-drove the winning entry in the 2011Rolex 24 at Daytona for Chip Ganassi Racing with Felix Sabates. Co-drivers were Pruett, Rojas and RLL ALMS driver Joey Hand. Competed in the event a total of five times. Also competed in the 12 Hours of Sebring sports car races two times. Competed in four A1 GP races in 2006 (Mexico, USA, China, Czech Republic). Made one start in the Indy Pro Series where he started from pole and led 221 laps en route to a second place finish in a support race to the 2006 USGP. Began racing karts in 2000 at the age of 11 and continued for four years before moving to the Formula BMW series in 2004 on a scholarship. Won one race and finished on the podium six times in 12 Star Mazda series events in 2005. Also claimed the 2005 SCCA National Formula Atlantic championship at the SCCA National Championship Runoffs at Mid-Ohio Sports Car Course and started from pole to win the SCCA National event at Road Atlanta.